Charles Mill Lake Park offers a variety of campsites that range from waterfront with panoramic views of the lake to primitive campsites nestled in the woods. More than 450 campsites are available for RVs and tents to camp for a night or longer (discounted 30-day camping rates are also available). Each campsite is equipped with a picnic table and campfire ring. 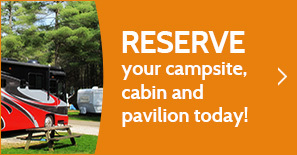 If you choose an electric campsite, 30-amp service is provided. Pets are welcome in all areas except for a small section at Eagle Point Campground.